With the first half of the triathlon season in the rear-view mirror, there’s nobody looking forward to the rest of the year more than professional triathlete Carrie Lester. Earlier this month. Lester, the KIS Coaching coach and athlete, who is coached by boyfriend and professional triathlete, Scott Defilippis, dominated the women’s field at the iconic Ventouxman Triathlon in France. With climbs on the bike that can make your leg muscles shake with exhaustion, Lester displayed her talent and fitness, showing the rest of the world that she, once again, will be looking to three-peat a top 10 performance at the Ironman World Championships. 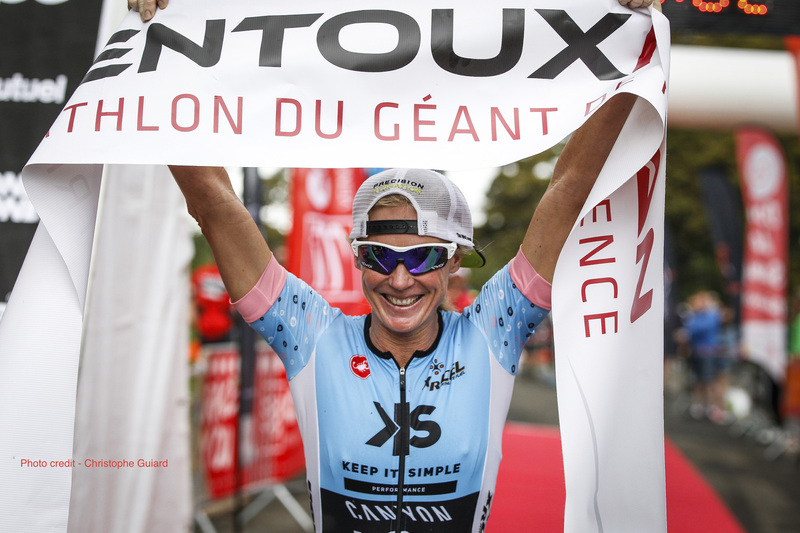 We checked in with the newly crowned champion to uncover her continued training plans in France, how her nutrition plan helped her forge to the front of the pack, and what it was like to share the title of “winner” with someone very near and dear to her heart. XRCEL: What was enticing about Ventouxman and made put it on your race schedule? Carrie Lester: We wanted to race a half distance race about three weeks out from Ironman France and this race was perfect. The difficulty of the course and racing over the mythical Mt. Ventoux was what really enticed us to the race and knowing what this would do for our preparation made the decision easy. XRCEL: Going into the race, what was your goal, knowing it’s such a tough course and that it would be a barometer of your fitness? CL: The goal was really just to make the race a good, hard effort and add it to the fitness bank for Ironman France. Climbing Mt. Ventoux took me about an hour and twenty minutes and, the fact that I felt stronger as I went up and was able to have a strong run at 4500 feet, was a good indicator of fitness for sure. XRCEL: What was your nutrition plan and how did you utilize XRCEL throughout the race? CL: The plan was to not be in a deficit before starting the climb up Mt Ventoux. The first 60 kilometers of the bike was rolling and pretty quick, so this was when I made sure to fully-fuel myself well enough to start the climb by drinking and taking in calories. I had two XRCEL plus fluid on the flatter sections and then another two XRCEL during the climb along with a chocolate bar. I took two more XRCEL’s during the 20 kilometer run. XRCEL: At what point in the race did you believe you were going to win and how did you stay focused for the remainder of the race? CL: I was in the lead after the swim and knew I was riding well when I started catching some of the men on the climb up Mt Ventoux. I didn’t know where the next female was, but I couldn’t see anyone during the one out and back on the run, so I assumed I was safely in the lead (which I know you should never do). This was good for me heading into the run as it was at 4500 feet, through wet and slippery trails. I didn’t want to have to push myself with Ironman France only a few weeks away. XRCEL: When you crossed the finish line as the winner, when did you realize that Scott had won too? CL: The last time I saw him on the run course, he was close to the lead male and I knew he would have been able to run him down, but I didn’t know he had won for sure until I hugged him at the finish line. I didn’t care that I had won because I was so happy for him. He was holding the finish tape for me, which was really special. To find out he won, I was so happy for him we both started crying. He deserves every win as he works harder than anyone I know. XRCEL: How does the dynamic as “coach and athlete” help you in your training and racing? CL: We certainly have our stressful moments, as every athlete/coach would, but we show a lot of respect for each other and we always manage. We just get the work done, but still make sure we are both enjoying what we do and have a balanced approach to training, racing, and life in general. XRCEL: What does this win do for you as you as you prepare to defend your title at Ironman France? CL: Win or not, it was a great race to add to the fitness bank. We have both had a great training block since then and I feel we are both heading into Ironman France in really good shape. There is stronger competition this year on the women’s side, but I am racing just as fit, if not fitter, than last year. If I put down the performance I am capable of, I will be happy with wherever that places me, but the win would be a dream. XRCEL: What is it about the training in Leysin that helps you prepare for the second half of your season, including two Ironmans? CL: Leysin is at about 4500 feet of altitude and we can swim and get in some run sessions here as well, which is a big fitness benefit. All of the riding is hard as every ride includes some form of climbing, so you always have to push yourself. After 10-12 weeks of this, it builds a lot of strength and, add the difficult races we do, and it all carries through to the end of the year. XRCEL: How do you use your win at Ventouxman to get mentally and physically prepared to compete for the Ironman World Championships? CL: I we still have to race Alpe d’Huez Triathlon and Embrunman and then have a short rest before the final build for the world championships. Those races. for me, are the physical and mental preparation I need for Kona. They add so much strength at the end of our trip and also allow us to have a more “relaxed” Kona build. I don’t need to bury myself with long sessions every single week until the race because all of the work has been done here. It’s a matter of taking some time after the trip to rest up and then just enjoy the final four weeks of preparation. XRCEL: How did you and Scott celebrate your huge, double win at Ventouxman? CL: We spent a night in Annecy on the way home and then enjoyed dinner with friends back in Leysin. We didn’t do anything crazy and jumped straight back into the training for Ironman France. After the Ironman, we will have one week with Scott’s family, who are coming over for the race, so that will be a week of celebrating both races along with his parents 50th anniversary.